“The Northern Libraries Colloquies are the result of a casual conversation between two librarians some five to six years ago. Garth Graham in charge of a library giving services to the Yukon, and Nora Corley Murchsion, then in charge of a library giving services to researchers and others interested in northern regions, but from a library not located in a northern region, (namely, the Arctic Institute of North America in Montreal) thought it would be a good idea for librarians whose libraries were oriented towards northern regions to get together to exchange ideas and information about each others’ collections and needs. The Northern Libraries Bulletin, first published in 1971 and still in production (issue no. 57 was published in 2005), has, over the years, contained a wealth of information on such topics as new publications, relevant news from other organizations, reports on colloquy meetings, and, occasionally, obituaries for cherished colleagues: Hubert Wenger, for whom the colloquy’s Wenger Award is named, in 1995, and William Mills, librarian at Scott Polar Research Institute, in 2004. The newsletter name was changed to Polar Libraries Bulletinwith the colloquy name change in 1988. Editors over the years have included Phyllis (Nottingham) DeMuth, Kay Shelton, Nancy Lesh, Cathie Innes-Taylor, Lynn Lay, and William Mills. The Bulletin won the 1998 Haworth Press Award, worth US$1,000. Colloquy proceedings have been published and are the responsibility of the host institution. They are listed on the Colloquy’s web site. The 4th Northern Libraries Colloquy was organized by the Arctic Institute of North America in Montreal, Canada in 1974. Northern information systems, including automation plans for the Arctic Bibliography, were discussed and libraries in Ottawa were visited. At the business meeting, a resolution presented for the group to become more organized was defeated, as was a motion to change the name to Northern Libraries Association. Over the following years several attempts were made to become more organized in order to become a ‘legitimate’ organization from which funding attempts could be made for various purposes. These attempts gained momentum in the 1980s and finally resulted in approval of a constitution in 1994. The 6th Northern Libraries Colloquy was organized by the University of Alaska at Fairbanks, Alaska, in 1976. This colloquy began with a memorable Fourth of July train trip from Anchorage to Fairbanks, with a tour of Mount Mckinley (Denali) National Park. Presentations were balanced to focus on both public and special libraries in Alaska. Field trips to the CRREL permafrost tunnel and the musk-ox farm near Fairbanks put librarians in touch with their collections to a greater extent! A passionate session titled, “After the Bibliography, what?” reflected the realization of the group that the Arctic Bibliography, 16 volumes edited by Marie Tremaine and Maret Martna, would no longer receive funding from any government source in the United States or Canada despite direct efforts by the colloquy to continue this service. No further printed volumes were published. A logo, centering on the North Pole, was adopted at the business meeting and appeared on the Northern Libraries Bulletin/Polar Libraries Bulletin until 2000 when a new logo was officially adopted showing a polar bear and a penguin together. This has caused some confusion about whether these two animals belong in the north or in the south respectively! The 8th Northern Libraries Colloquy in 1980 was organized jointly by the Boreal Institute for Northern Studies at the University of Alberta, and the Department of Information Resources of the Yukon Territorial Government. The meeting was hosted in two places – Edmonton, Alberta, and Whitehorse, Yukon Territory, bringing together libraries about the North and libraries in the North. The program in Edmonton was filled with papers on various computerized systems, both in-house and commercially available, several of which were demonstrated. These developments in automation offered the opportunity for sharing resources on a wide level among many institutions. The program in Whitehorse was concerned with services to isolated northern communities, mainly through government agencies and libraries. A boat trip was made on the Yukon River. The 10th Northern Libraries Colloquy, organized by the Centre for Cold Ocean Engineering and the University of Newfoundland, was held in St. John’s, Newfoundland, in 1984, and focused on collections in Newfoundland and Labrador. A session on the possibility of an international polar information network suggested further means of cooperation between colloquy librarians. The development and impact of computerized systems was also discussed and presented in a poster session. The 86 delegates will not forget experiencing ‘Screech’ and the opportunity to kiss a codfish, thus becoming honorary Newfoundlanders. A post colloquy field trip was made to the islands of St. Pierre and Miquelon. The 11th Northern Libraries Colloquy was held in 1986 in Lulea, Sweden, organized by Lulea University. Papers on the literature of arctic minorities, older arctic literature, space research, and the future of libraries and information centers were on the program. The SPRILIB database, an online information retrieval system for the Scott Polar Research Institute (SPRI), was introduced as an example of an internal cataloging system with potential to be included in a widely accessible commercial database. SPRI’s preference was to use a host which already contains other cold regions databases and move toward a consolidation of northern information on one host, or possibly with a single database. The idea of producing SPRILIB as a video disc catalogue, using optical disc technology, for sale to subscribers was raised. These ideas were ultimately realized with the publication of the NISC DISC (see 13th Colloquy below). A post colloquy trip was made to Abisko, Sweden, and Narvik, Norway. The 12th Northern Libraries Colloquy, organized by the Institute of Arctic and Alpine Research and WDC-A for Glaciology at the University of Colorado, was held in Boulder, Colorado in 1988, with the theme “Northern Information – The Global Connection.” Improving support to arctic research efforts by increasing the efficiency of access to data and information was a main topic. Networking plans were again promoted but a design for such plans remained elusive. A pilot project at the Library of Congress, with U.S. National Science Foundation backing was announced. It would create a PC-based CD-ROM file of the Cold Regions Bibliography Project (COLD). This successful pilot became the ‘NISC DISC’ (see 13th Colloquy below) which is still in use and also available on the internet. This CD-ROM would satisfy the need of remote installations to have databases on hand where it was not possible to establish a main frame computer connection. At the business meeting, a recommendation to change the colloquy name to Polar Libraries Colloquy was approved in order to reflect and encourage interest in Antarctic regions. For the 13th Polar Libraries Colloquy, in 1990, the group happily returned to Rovaniemi, Finland where the Rovaniemi Library organized its second colloquy. Several ‘firsts’ occurred at this colloquy: the colloquy theme, in this case “Man’s Future in Arctic Areas,” appeared on the cover of the proceedings, which carried the name “Polar Libraries Colloquy;” several delegates from Russia attended and gave papers; the newly developed polar regions CD-ROMs,Arctic & Antarctic Regions NISC DISC (1st ed., 1989) and PolarPac (1st issue, 1990) were demonstrated; and, after many years of proposing a more organized structure for the colloquy, a committee on the issue was formed to report at the next colloquy. The meeting was followed by a bus trip to Murmansk, Russia, where an Intourist guide and interpreter aided visits to libraries and science centers. The 14th Polar Libraries Colloquy in Columbus, Ohio, in 1992, was organized by the Byrd Polar Research Center of The University of Ohio. Papers, including several by Russian delegates, were centered around the theme “International Sharing of Polar Information Resources.” Updates on several computerized systems were balanced with a session on polar archival resources with input from the Byrd Polar Research Center Archival Program. An interesting panel session of ‘polar’ journal editors was held. At the business meeting the University of Alaska Fairbanks was designated to be the archive center for the Polar Libraries Colloquy. “Polar Libraries Colloquy Guiding Principles” were adopted, with structures to be presented at the 15th Colloquy. The 15th Polar Libraries Colloquy, held in 1994 in Cambridge, UK, was organized by the British Antarctic Survey and the Scott Polar Research Institute. Its theme, “Bi-polar Information Initiatives,” attracted a truly international (including the southern Hemisphere) group of attendees, interested in both polar regions. At the somewhat unruly business meeting, the colloquy voted for a constitution which established a steering committee and a membership fee. Both institutions and individuals may become members. A steering committee of ten members was elected. It was moved and passed that the Polar Libraries Colloquy develop liaisons with other international organizations with interests in the polar regions. A very entertaining and successful fund-raiser, which grew into the Wenger Award, was organized by Ron Inouye. In 1994 the Wenger Anthropological Eskimo Database became available on CD-ROM, (and in 2003 on the Internet), with Hubert and Beatrice Wenger sponsoring its development at the University of Alaska Fairbanks. The 16th Polar Libraries Colloquy, organized by the University of Alaska Anchorage, met in Anchorage, Alaska, in 1996 with the theme “Creativity, lighting the poles: collaborative solutions to common problems.” At the business meeting the first four colloquy Honorary Members, Nora Corley Murchison, Nita Cooke, Beatrice Wenger, and Harry King, were elected and acclaimed for their service to the colloquy. Following on the successful auction at the 15th Colloquy, a resolution was passed to establish the Hubert Wenger Award to be paid out by the proceeds (typically US$1,000 to US$1,500) from the auction held at each meeting. The award supports qualified delegates who otherwise might be unable to attend colloquy. Following up on the initiative of forming liaisons with other organizations, the colloquy voted to become a Standing Advisory Group within the International Arctic Science Committee (IASC). William Mills attended their Leningrad meeting in 1997. The Partial Proceedings of the 6th Northern Libraries Colloquy, transcribed from tapes recorded at the University of Alaska Fairbanks in 1976, were published as an appendix. In 1998, the 17th Polar Libraries Colloquy, with an organizing committee of several Icelandic agencies, joined with the 24th Annual Conference of the International Association of Aquatic and Marine Science Libraries and Information Centers (IAMSLIC) to meet in Reykjavik, Iceland for discussions on the theme “Electronic information and publications: looking to the electronic future, let’s not forget the archival past.” A pre-conference study tour to Akureyri in northern Iceland offered an opportunity for attendees from both groups to get to know each other and to visit libraries and collections at this location. At Reykjavik delegates took full advantage of sharing interests and information through their two organizations. The 18th Polar Libraries Colloquy, held in Winnipeg, Manitoba in 2000 at the fabulous Fort Garry Hotel, was organized by the Hudson’s Bay Company Archives. Appropriate to the theme “Gateways: archives and libraries into the next millennium,” the opportunity to visit the Hudson’s Bay Archives, which contain the records of the most important and longest-lived trading company ever to have operated in polar and northern regions, was a highlight for all participants. A field trip was made to Gimli, Manitoba, a town on Lake Winnipeg well known for its Icelandic settlement history. Many participants took a post-Colloquy train journey to Churchill, Manitoba, on Hudson Bay. Visits were made to the Churchill Northern Research Centre, the Eskimo Museum, and an empty polar bear jail! The 19th Polar Libraries Colloquy in 2002 in Copenhagen, Denmark, was organized by the Danish Polar Center. Papers on the theme “Poles apart – poles on-line,” formed a whole picture considering cooperative projects, changing user habits, new perspectives on polar publishing, incorporation of photo collections into the digital age, and reminders that non-digital information cannot be neglected. It was announced that the Arctic Bibliography, including a never published volume 17, had been prepared for digital publication on the Arctic & Antarctic Regions CD-ROM and on the BiblioLine Internet service by the National Information Services Corporation (NISC). It is globally searchable with the many cold regions databases already on the NISC DISC. A field trip to the wonderful Viking Ship Museum reminded us of the timespan of polar and northern information. A particularly lively auction to benefit the Wenger Award was held. The 20th Polar Libraries Colloquy in 2004 was held in Ottawa, Canada, organized by Indian and Northern Affairs Canada. The theme was “Polar research: let us share – Amiqqaaluta” and the proceedings were dedicated to the memory of William Mills who died shortly before the colloquy took place. InPolar Libraries Bulletin issue no. 56, the front page carries a title “2004 Colloquy in Ottawa: a valuable conversation,” of which the subtitle aptly describes the character of this colloquy. The intimate venue allowed for formal and informal discussions and an eclectic group of presentations which even included the reading of a play written by Dennis Stephens! The colloquy did not quite end in Ottawa since IAMSLIC (see 17th colloquy above), in September, sponsored a joint half day of presentations with several colloquy members at IAMSLIC’s 30th annual conference held in Hobart, Tasmania, Australia. The 21st Polar Libraries Colloquy in 2006 was held in Rome, Italy at the National Research Council (CNR) and organized by the Programma Nazionale di Ricerche in Antartide (PNRA). The theme was “Building Polar Networks: a strategy for the future,” and served as an apt description of the papers presented. 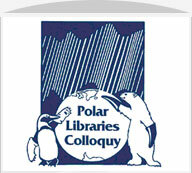 The 22nd Polar Libraries Colloquy in 2008 was held in Edmonton, Canada. It was organized and hosted by the Canadian Circumpolar Institute (CCI) University of Alberta, and the Circumpolar Collection of the University of Alberta Library. The theme, “Currents of Change: The Future of Polar Information,” was very appropriate in light of the opportunity for attendees to attend the meetings of the University of the Arctic and to participate in plans for the International Polar Year 2007-2008 (March 2007-March 2009).